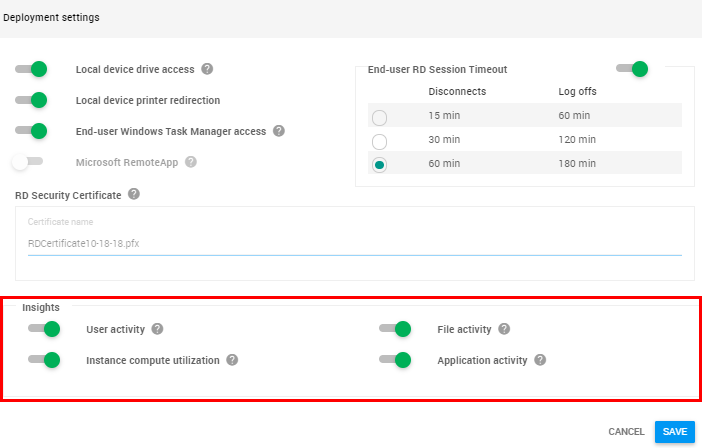 New insights features are available for all new deployments. The implementation for existing deployments will occur in phases, our team will gradually enable the new insights for the existing deployments in alphabetical order. Feel free to contact the support team for more information. itopia CAS uses Windows services that are by default installed in all the Windows machines during the deployment process. Services are running in all booted VM's in regular intervals and saving data in customer's own GCP project using BigQuery. Itopia databases are not storing the data. The monitoring data is uploaded from your BigQuery to CAS portal once a day. How to enable / disable Insights? Insights are enabled by default in all the new deployments and will be gradually enabled for the existing deployments. You can disable insights from the Deployment settings. Click the gear in the top right and look at the bottom section of the settings window to enable /disable the Insights features. Google has a free tier for some operations inside BigQyery, you can check the pricing details here. In our experience, the average cost per 2 terminal server deployment turned on for 24/7 is approximately $0.71/ month. User Activity tab displays the number of your online users per hour throughout the day. On the bottom you can see what server were the user connected to. Note: Due to a BigQuery schema change released on 4/1/2019 you won't be able to make single queries combining the time periods before March 31st and after April 1st. Choose the deployment on top and you can review what files are accessed most frequently and by which users. 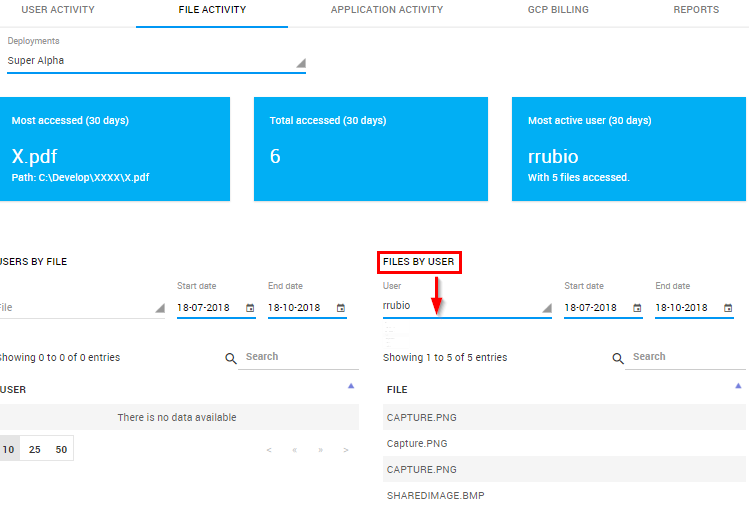 In "Users by File" section you can select a file and see users that access it. Control the time range on the right from the File/ User drop down. 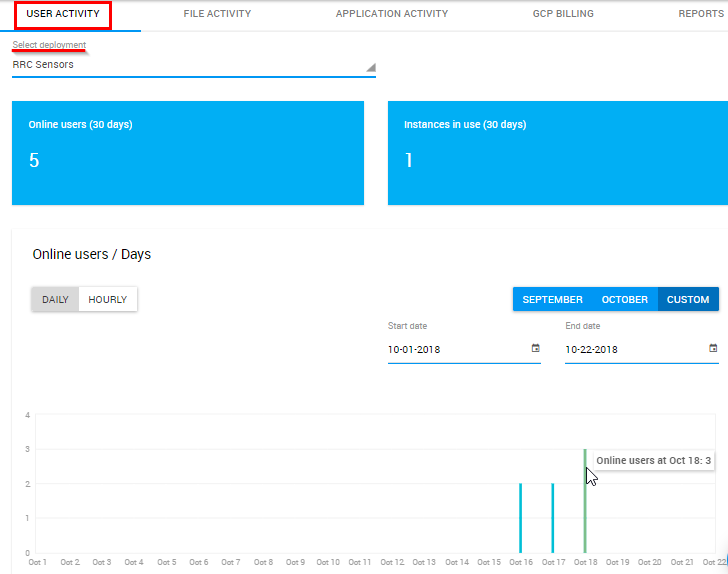 Application activity feature shows most used applications and users who access them. You can see 2 filters. 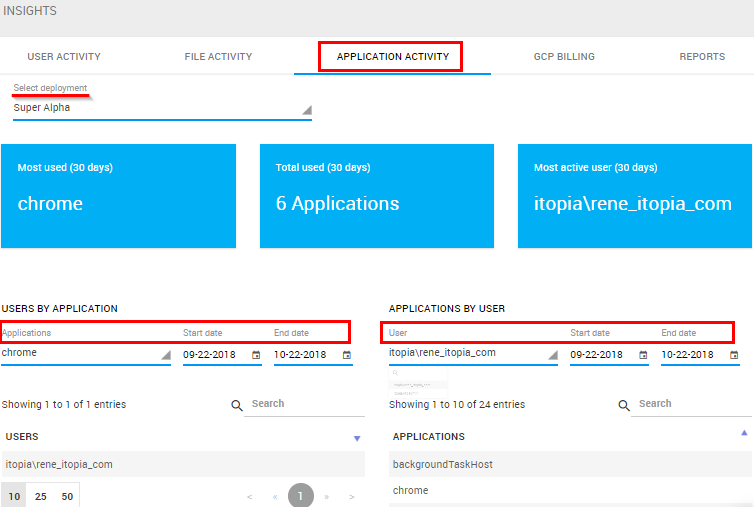 Application filter on the left that presents users that access the selected application and User filter on the right that shows applications each user accessed on the selected date. 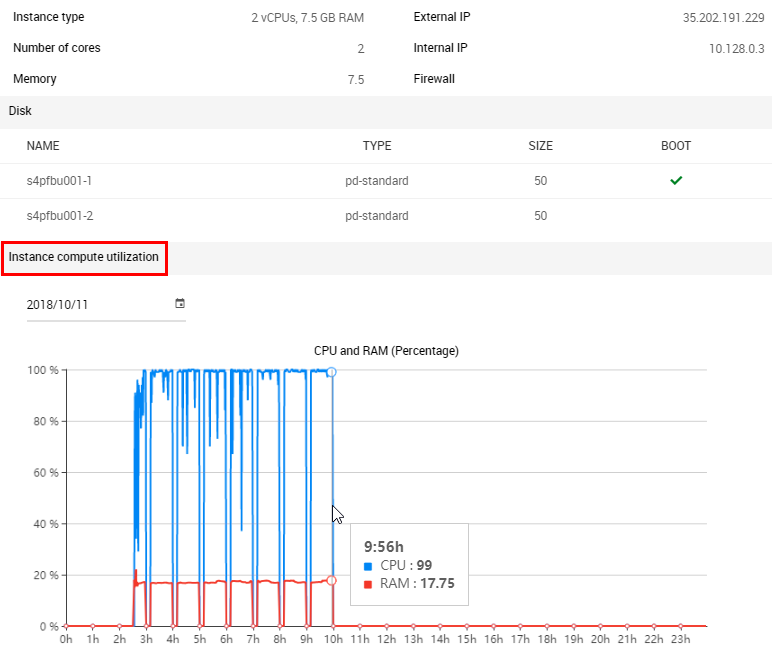 You can access resource utilization insights from VM Instances module under Cloud Manager section.